My first job working in the museum field was as a guide. I was still in high school and I had the opportunity to volunteer at a local museum giving people tours. I can still remember the magical feeling that comes about when you help people to make a connection to something tangible, to something from their own experience. I haven’t had a lot of opportunities to do this type of hands-on work in recent years. My role has mainly been behind-the-scenes helping to create environments and opportunities for visitors to enjoy. Some pretty sharp kids interviewed me about my job. I decided it was a good opportunity to pull out one of the museum’s artifacts and let them see it close up. The object I chose was a photo album, circa 1908. I was reminded how powerful that the tangible object is. The album fascinated the children. Many of them had never seen one before. And the concept that a person who was on vacation would create this to preserve their memories was bizarre. I then showed them how I take an object like this and transform it into a digital medium. Although I had a large screen projector, the children still kept going back to the real object. Once again – I am reminded of how powerful the real is. No matter special the digital experience can be it must be rooted in something tangible. 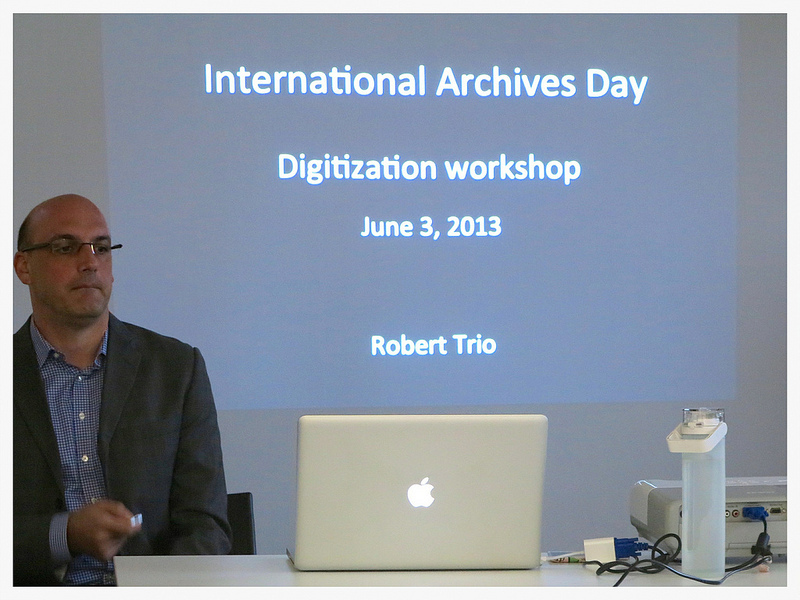 In June I was asked to give a workshop by the Hong Kong Archives Society on the topic of digitization. After the lecture I recreated the lecture to share with everyone. Hope you enjoy it. Digitization is becoming a standard practice for libraries, archives and museum around the world. No longer a luxury, LAMs utilize digitization as a part of a larger collections management policy. Today every institution must create a practice that is based on a standard and consistent with their institutional mission and vision. Robert Trio, Project Officer for Technology at the Hong Kong Maritime Museum, will conduct a workshop that explores different strategies in building a building a digitization policy. The areas will discuss capture, documentation, access and long-term sustainability. 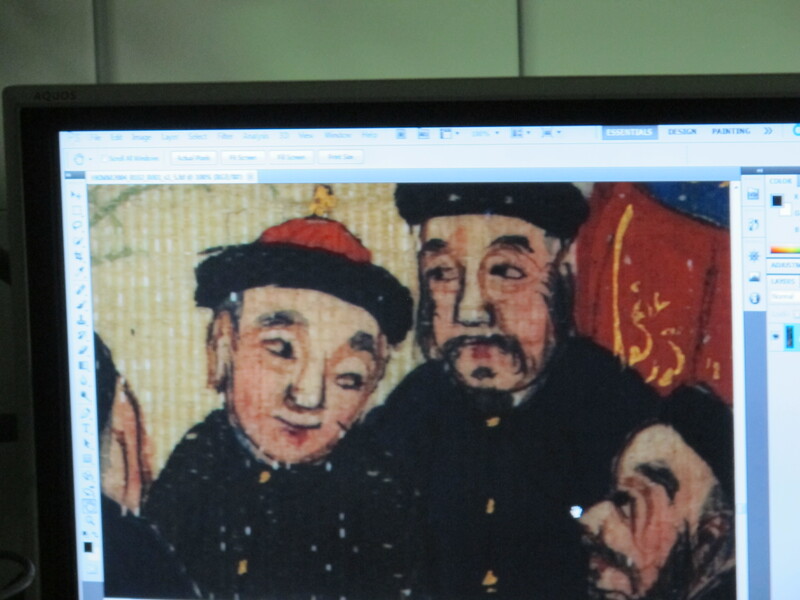 He will also discuss a recent digitization project that the museum undertook in partnership with Kyoto University. The workshop will be designed as an open discussion. Although technical specifications will be a part of the talk, the workshop is designed to focus more on the issues that institutions must face and consider. One of the great aspects of being based in Hong Kong is that it is geographically located in the right spot. Since the days of the China Trade, its location as the crossroads of east and west gave this location the unique distinction of where goods and more importantly ideas converged. 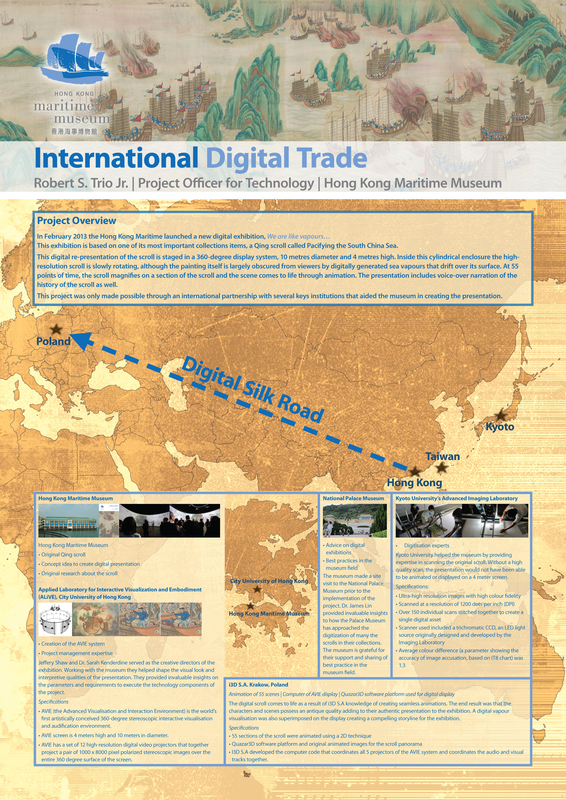 As the project manager for the Hong Kong Maritime Museum’s digital exhibition, We are like vapours … I took advantage of these ancient trade routes to bring together a group of talented practitioners to help the museum reopen to the public with one of the most dynamic and inspiring digital exhibitions ever to hit the Hong Kong scene. In March, I presented a poster at the TELDAP conference in Taipei in support of this year’s theme, International Partnerships. Preparing and assembling the information for this session helped me to outline the key pieces of this exhibition. Approximately two years ago, I was approached by the Director of the Maritime Museum to prepare a concept for an exhibition based on one of the most significant pieces in the collection, a Qing scroll called Pacifying the South China Sea. This scroll is 18 meters log and 55 centimeters high. As an interpretive piece for a museum, it is wonderful. The scroll tells the story of pirates, sea battles, love and betrayal. It would be a suitable major motion picture staring Chow Yun Fat. 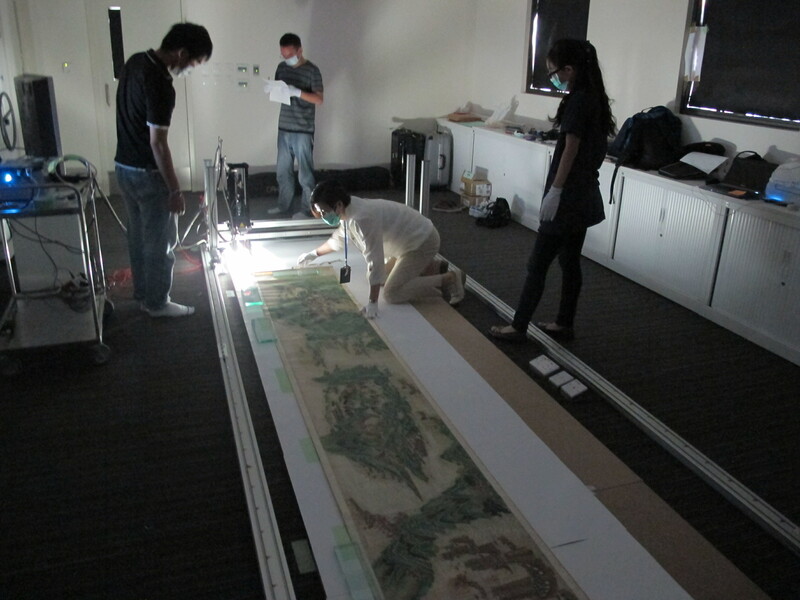 But the nature of the scroll being so large and also so fragile made it a difficult object to display in situ. Most of the details and symbolism are lost in the fine detail that is only appreciate if one is holding the object in their own hands and at an arm’s length. Based on some previous digital forays, I began investing other scroll exhibitions that used a digital platform. In the end, I prepared a brief that had several elements: digital projection of the scroll, key scenes animated to add clarity of the storyline and using vapours superimposed on the scene. Vapours were chosen because there is an early Chinese history that attributes a quote to one of the key pirates of the narrative, Zhang Bao in which he states, “We are like vapours” in order to illustrate this fleeting moments of his actions and how they will soon dissipate in time. Ideas are great. But in the end, it takes experience and best practices to make a concept a reality. The most important moment in this process was when I met Sarah Kenderdine at City University of Hong Kong. Over the past few years City University’s ALiVE laboratory has broken new ground in the area of augmented reality and immersive experiences. Sarah and her team proved to be the missing link of the project. The museum formed a partnership with City University to create a joint project combining their expertise in the area of digital media and the museum’s expertise in the history and significance of the scroll. The second piece or port of call was Kyoto University. Kyoto scanned the scroll at an amazing 1200 dpi and extreme color fidelity. I have already written a little about this experience in my article Extreme Digitization. Lastly, I traveled along the Digital Silk Road to Poland. In Poland the museum hire i3D to give the scroll new life. They created a series of 55 animations and created the programming that allows the scroll to digitally be seen by the visitor. One of the most difficult things about the presentation is that there are 5 separate projectors in the presentation. And the presentation is always scrolling, so the action does not just occur on one spot of the 360° screen but the entire surface. The animation also had to be done in such a way that that the original artwork had to be respected. In the end the scenes were done in a 2D format that make the characters look like Qing Dynasty figures in action, not 21st cartoons. The museum benefited from having a talented team of international partners. Each partner brought an energy and expertise and could not have been produced in-house by the museum. This combined strength yielded a result that was greater than the parts. Lastly, the sustainability issue: partnerships are based on relationships. And the relationships formed by the museum will help serve as the platform where many more exciting projects can grow. It is considered one of the highlights of the museum. Measuring nearly 18 meters and painted almost two hundred years ago, the Pacifying of the South China Sea scroll offers a unique learning opportunity to visitors at the Hong Kong Maritime Museum. An unknown Qing painter divided the scroll into twenty individual scenes. Each section is marked by four Chinese characters originally intended to allow the viewer to carefully follow the story as they unrolled the silk fabric. The scenes depict pirate ships, Han troops, battle scenes, rich pageantry, everyday life, and celebration. The scroll chronicles events that took place over a two-year period and the painting accurately shows the changes from spring to summer and autumn to winter, with the foliage on the trees and the garments of the people depicted on the surface moving through time. The story tells how Chinese piracy was subdued in the early 19th century by the forces of the Emperor. The length of the scroll makes it a difficult piece to display in its entirety. I was given the charge to take this wonderful object and create two digital exhibitions that would accompany the original in the new galleries of Pier 8 Central. One of the reasons that a digital interpretation was chosen is because of the limitations of the original piece. It was recognized that because of its length, the museum would not be able to show each of the twenty scenes at any one time. Also the painting depicts a complicated story filled with symbolism that without interpretive pieces to accompany the different sections, the nuances and the meaning of the scroll would be lost to the visitor. Lastly, because of its age and fragility, the original may not be able to be displayed indefinitely. As with any project, the core beginning of creating an exhibition is starting with good information. One of the fortunate things is that the events of the early 19th century and the problems of piracy in the Hong Kong area are well documented. In particular there are primary sources like , History of the Pirates Who Infested the Sea From 1807 to 1810, written by Yung-Lun Yüan in 1830 that help make sense of this complicated story. It was only when a great collection of data was brought together about the people, places and the events that the scroll shows, that a digital interpretive plan could be laid out. Without the hard work of historians like Dr. Stephen Davies, who first began unravelling these pieces years ago, this project could not have been possible. I hope to write more about the details of the two digital projects that are being prepared for the exhibition spaces. But at this time, both are still being in the works. 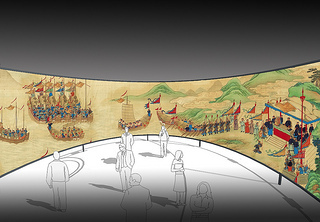 But the general idea is that the first project is to create a 360° theatrical presentation in which visitors will encounter animated sections of the scroll along with lighting and sound effects. The second project involves creating a digital touch screen of the scroll with hotspots that highlight the meaning of each of the different characters and scenes. Before theses two projects could proceed however, there was a realization that better digital copies were needed. The scroll was originally photographed seven years ago and although high quality tiffs were created, the quality was still not high enough for animators to create seamless transitions of movement. And the touch screen demanded that visitors would have the ability to see a pimple on the end of a person’s nose, even though many of the characters on the original piece are less than a 1cm high. Truly one of the reasons that this scroll is such a treasure is that each section is carefully painted with fine detail and accuracy. Many of the minute details have never been fully appreciated or shared with the public. And that is why a 100% digital scan of the scroll was necessary. 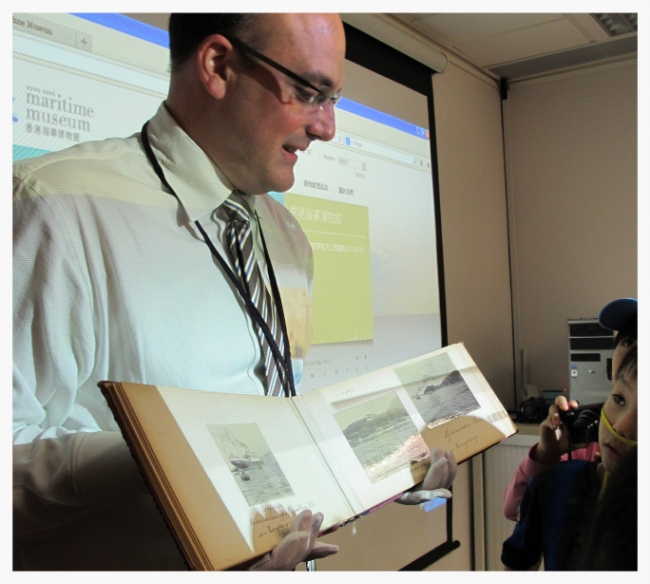 When undertaking a major digitization project, it is important to work with professionals. The museum was fortunate to make contact with Dr. Ari Ide-Ektessabi of Kyoto University. He is one of the leading figures in marrying advanced technologies and cultural heritage. His expertise includes not only producing higher resolution and dpi of cultural objects, but an advanced manner of color representation. His team just recently completed scanning the original blueprints of the RMS Titanic. Fragile objects like the Qing scroll cannot be unrolled on a daily basis. That means each time it is brought out for examination, the work done on it has to count. Dr. Ide-Ektessabi’s techniques include non-invasive procedures that do not harm the scroll. It was upon his recommendation that the scroll was to be captured at an amazing 1200 dpi. Simply put, for every inch of the scroll there would be 1200 pixels created in a lossless digital file. For example, an iPhone has 326 pixels across its width which means a figure on the scroll which is a quarter of inch wide would fill the entire screen at perfect clarity without any enlarging or pixelization. Now imagine what that means in an application in which a high definition monitor or a four-foot projection is employed. The possibilities become limitless. The scroll was scanned at 15 cm at a time. In all, it took over 150 individual passes to capture the entire length. In all 100GB of data was collected. With each pass the quality was checked. Curatorial staff of the museum immediately became engaged in the project as more images came to light. Some details less than an eighth of a centimeter high had never been noticed before, but now displayed on a large monitor the minute details came into focus. Perhaps only the original painter had only known these details existed before now? This type of scanning will not only provides the museum with a high quality archival digital copy of the scroll but a mechanism for scholars all over the world to study even the smallest detail. It will be an important resource for the museum for years to come. Digitization will never replace the original but this technology should be seen as an equal partner. Digitization projects that focus on a higher quality capture will allow cultural institutions to promote research, preservation, display and presentation. By unlocking the digital world, the originals will hold a higher level of relevance in collection by increasing access to their knowledge.